PSNews - So far, the Hanoi tourism promotion project has completed its first phase, in which 12 shot films from 1-5 minutes and one 30 minute film have been screened on the CNN channel. These shots have received good feedbacks from audiences. To expand the scale and quality of the strategy to promote city's image, Hanoi has boldly spent US$2 million in popularizing the history, culture and people of Hanoi in particular and Vietnam in general on the CNN channel in the period of 2017-2018. Under the strategy, Hanoi has promoted its cooperation with the CNN channel to create a Hanoi tourism brand on the world tourist map and attract more strategic investors in developing local tourism products. So far, the Hanoi tourism promotion project has completed its first phase, in which 12 shot films from 1-5 minutes and one 30 minute film have been screened on the CNN channel. These shots have received good feedbacks from audiences. In addition, Hanoi has actively coordinated with diplomatic missions and international organizations in the city as well as Vietnamese embassies abroad, domestic and foreign airlines to expand its tourism market. 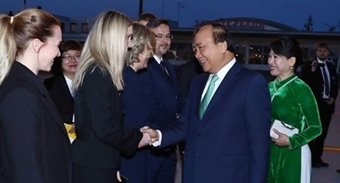 Hanoi also organized many friendship spring tours for more than 400 spouses of foreign ambassadors and representatives of international organization in Hanoi as well as international press agencies to experience tourism products in Hanoi capital. In 2016, Hanoi welcomed 21.83 million visitors, including 4.02 million international ones. Its total tourism revenue reached 61,778 billion VND.